The Mosaic cushion is especially suited for users who require a cushion for basic level skin protection, support and comfort. Using air flotation technology, the mosaic cushion is not only comfortable, but the use of interconnected Air cells to distribute forces evenly across the cushion allows it to be used effectively for low risk skin protection. 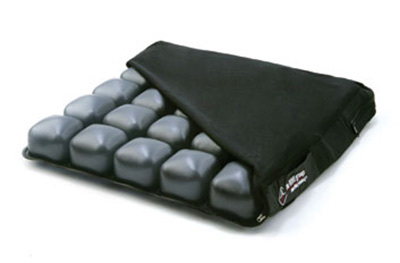 The MOSAIC® cushion is designed for use by individuals who require an environment to assist in the prevention and/or healing of up to Stage II pressure ulcers (pressure sores, decubitus ulcers) as deﬁned by NPUAP & EPUAP, who require postural support but have partial or full sensation in the seated area and have fair to good seated balance, and who may be at risk for pressure ulcers due to one or more of the following risk factors: illness, injury, disability, immobility, incontinence, shear and friction, pre-existing skin defect, low body mass, poor nutrition, or overall poor health. STEP ONE: Place cushion on chair, making sure it is centered and the cells are right side up, with air valve in front, left corner. Turn valve counterclockwise to open. Note: The MOSAIC1816C cushion can be rotated to ﬁt 16” x 18” / 41 cm x 46 cm chairs. STEP TWO: Slide the pump’s rubber nozzle over the valve and inflate the cushion until it begins to slightly arch upward. STEP THREE: Turn valve clockwise to close. Remove pump. STEP FOUR: Have the user sit in the chair, making sure the cushion is centered underneath. The user should be seated in their normal sitting position. STEP FIVE: : Slide your hand between the cushion’s surface and the user’s bottom. Lift their leg slightly and feel for their lowest bony prominence. Then lower their leg to a sitting position. STEP SIX: Turn valve counterclockwise to let air out, while keeping your hand under the user’s lowest bony prominence. Release air until you can barely move your ﬁnger tips - no more than 1 inch (2.5 cm) and no less than 1/2 inch (1.5 cm). Turn valve clockwise to close. NOTE: DO NOT sit on improperly inflated cusion. Under-inflated cushion reduces or eliminates the cushion’s beneﬁts and could increase risk to skin and other soft tissue. The cushion is most effective when there is 1/2 inch (1.5 cm) to 1 inch (2.5 cm) of air between the user’s bottom and the seating surface.